A security fence can protect your property from intruders and animals. 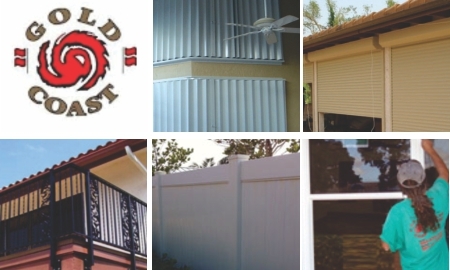 Gold Coast Hurricane Shutters and Fence has every option you can imagine because we manufacture our own security fence and provide installation to your residential, commercial, or public property. We have served the community for over 20 years and we pride ourselves on produces outstanding quality security fences. Florida’s fence contractors and fence companies, clearly regard Gold Coast as the preferred manufacturer for any security fence, whether it's residential, commercial, or industrial. We specify our security fences to you exact specification every time so you are 100% satisfied. Consider your Gold Coast Security Fence as an asset, not a liability. We look forward to providing your fencing needs for many years to come; we stand behind everything we do. Fence contractors and fence companies, serving Broward, Palm Beach, Miami-Dade County, prefer Gold Coast fencing products; so would you! Not only is our fencing durable and secure, but if anything should unfortunately go wrong with any aspect, we will get it back to its original perfect condition. Discuss your needs with us under FREE initial Consultation, get appropriate FREE Advice on your best options with us, and just think about the added market value you are putting into your building. A security fence adds value to your property. If you need to protect your commercial warehouse, business, or home, Gold Coast Hurricane Shutters and Fence is there for you. You know that our hurricane shutters are the best in the business, so we understand the importance of safety. You can call Gold Coast for your protection needs. We are a proud customer service oriented company and assure our clients' complete satisfaction. Custom work is always available, so that your security fence fits your specifications exactly. We are the experienced workers in the fencing industry; no job is too big or too small for us to handle.